One of the most prominent buildings on Karlsplatz Square, right next to the Karlskirche Church, is the one of Vienna Technical University. 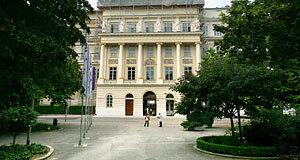 One of the most important universities of the country, the "TU" now occupies several buildings all over Vienna. The one on Karlsplatz is the main one. The university is divided into several departments, which include architecture, engineering, electronic engineering, maths and geoinformatics, physics and technical chemistry. The TU has approximately 20,000 students. The Technische Universität was founded in 1815 as the "k.k. Polytechnisches Institut" by Emperor Franz I. Back in the days, Austria realised that other nations - especially Great Britain - were ways ahead in terms of technical and industrial advancements. The Emperor fostered the foundation of all sorts of engineering schools: For mining, navigation, transport, general engineering. Many of these institutions were closely affiliated or even part of the military. The first master of this technical institution was Johann Joseph von Prechtl. In the case of the "k.k. Polytechnisches Institut", the military influence was relatively small until the revolution of 1848, when the university′s staff and scholars joined the revolting hordes of students. Afterwards, the heads of the university were army officers for a long time to ensure the "loyalty" of the engineers to the Habsburgs. The story of the "k.k. Polytechnisches Institut" is a rather successful one - when the German Empire gained shape from the fusing German Federation, several universities such as the one in Karlsruhe or Hanover were modelled after it. It was the biggest engineering college in the Habsburg Empire - bigger than similar institutions in Prague, Brno, Graz and Lemberg. By 1872, the Austrian engineers had worked their way up into higher social spheres after the age of industrialisation had finally arrived in the Austrian Empire - and the Polytechnisches Institut was re-named into "Technische Hochschule". With the end of the empire in 1919, women were allowed to enrol. In 1975, the institution was finally made the "TU" by changing its status from a Hochschule into a University. The old building on Karlsplatz dates back to the early 19th century and is supplemented with a modern one from the 1990ies in the most peculiar design, featuring owls and Egyptian-style falcons on the façade. The old building is in urgent need for renovations; in the past, the university even discussed to transfer somewhere else and let the central facilities to raise money. There were definite plans to move to the 22nd district and build a modern campus in Aspern. However, this plan was abandoned since the old, palatial court on Karlsplatz was seen as too important as a "spiritual" core of the TU. The front side of the TU is decorated with noteworthy alumni and celebrities that were connected with the university. The park in front of the uni is called "Resselpark" in commemoration of Joseph Ressel, the inventor of the marine screw propeller. It is usually full of druggies and bums and not appealing whatsoever. Attractions nearby include the Karlskirche and the attractions of the Karlsplatz, the ORF Funkhaus, the Palais Schwarzenberg and the Belvedere Palace and gardens. The neighbourhood of Wieden is good for a relaxed stroll, browsing small, independent shops or eating out.